Finding the right color scheme can be a daunting task if you’re not familiar with the basics of color coordination. Here are some tips and inspirations to help you choose a stunning palette for your decoration project. Understanding how colors interact is crucial when you set out to decorate your home. how colors interact, or color harmony, will make any room look like it’s posing for a magazine. No matter how tolerant we are, some colors are just not meant to be used together, and they will literally feel like an eye-sore. On the other hand, there are groups of colors that make particularly appealing combinations, and luckily, there are some strict rules governing their selection. 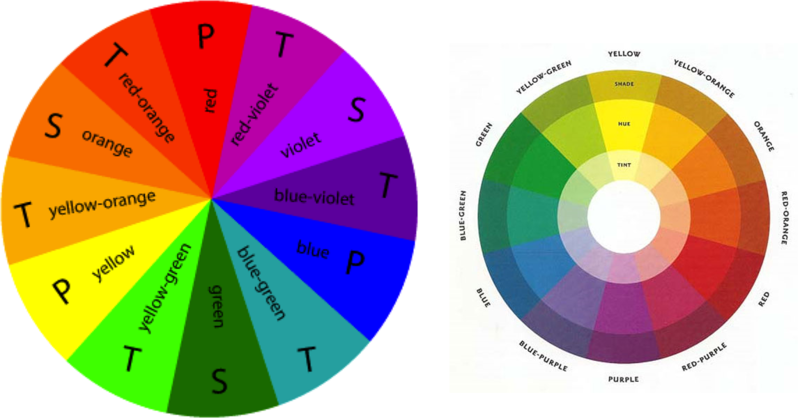 It all boils down to a color wheel and the basic color theory. A color wheel consisting of 12 segments is based on 3 primary colors: red, yellow and blue. When combined, the primary colors give secondary colors: green, orange and purple. The remaining segments of the wheel are filled with combinations of primary and secondary colors, and are named accordingly, e.g. red-orange. It’s as simple as that. The thing that seems to be most confusing is the terminology applied to different variations of a single color. We’ve got tones, shades, hues, tints, values… How to distinguish between the? In color theory, a hue refers to a pure color – this is what we usually mean when we ask “what color is that?” A tint is the mixture of a color with white, which increases lightness, and a shade is the mixture of a color with black, which reduces lightness. A tone is produced either by mixing with gray, or by both tinting and shading. Finally, when we describe a color as “light” or “dark”, we are referring to its value. A color wheel in itself is of little help if you don’t know how to use it. Of course you may act intuitively and go for colors that you think look good together. But for those who don’t want to rely on instinct, there are several predefined color scheme standards that can help us choose appealing color combinations. These combinations basically fall into two large categories: harmonious (analogous) schemes, which are based on adjacent colors, and contrasting (complementary), derived from opposite segments of the wheel. The monochromatic color scheme uses all the variations you can have in lightness and saturation of a single color. You just pick one color and work with its tints, tones and shades. Monochrome is the simplest color scheme to accomplish, since it is almost impossible to end up with something jarring and ugly when you operate with a single hue. Generally, monochromatic schemes look clean, soothing and elegant, but they might seem a little dull and overwhelming at times. Plus it can be hard to create focal points in the room. A good idea that gives a modern, striking effect it to break from the predominant color with a bold accent (e.g. grays contrast fabulously with juicy pink). The analogous color scheme uses three colors that are adjacent to each other on the color wheel, like yellow, yellow-green and yellow-orange. It is a very naturally looking scheme that retains the simplicity of the monochromatic design and is almost as easy to create, but it offers more variety and has a lot more interest. It is certainly not as rich and vibrant as the complementary palette, but allows for mild contrasts when used properly, especially that you can manipulate with the value of any of the three colors by making them lighter or darker. The best way to work with an analogous palette is to pick one dominant color that will take up the most visual space, support it with a substantial amount of another color, and finally, use the third color for accents. Using equal amounts of each color in this scheme is not a good idea. Combining warm and cool colors should be avoided as well. The complementary color scheme is a high-contrast combination of two colors that sit opposite each other on the color wheel, like yellow and purple or blue and orange. It is a good option if you want to make something really stand out, but there are some rules to stick to if you want to avoid a jarring, kitschy effect. First of all, the rule of thumb is to always favor one color over the other, or alternatively, use both of them for accents against a neutral background. This scheme looks best, however, when you choose a dominant color for the background and use its complementary color for accents. Another thing to remember is that using colors that are exact opposites with the same value right next to each other can be difficult on the eye. This is best avoided by changing the tint of one color and the tone of the other, or by adding a transitional color between them. So, if you want to use blue and orange, go for pale blue and make the orange darker. Also, consider the split complementary scheme, which is very similar to the complementary scheme in terms of using contrasts, but offers more variety and is easier to balance. The split complementary scheme is a variation of the standard complementary palette – it is intrinsically a high-contrast option, but offers more variety and seems a little less tense that its precursor. This is because split complementary schemes uses a base color and the two colors that sit next to its complementary. In other words, you take one color (yellow), determine its complimentary color (violet) and use the two colors next to the complimentary color (red-violet and blue-violet). The split complementary scheme is a good choice for beginners who want to work with bold combinations, but do not have much experience with color blocking. To make sure the effect is not overwhelming, it is best to use substantial amounts of neutrals to break up visual space. The split complementary scheme may be less flashy than the standard complementary palette, but it retains strong visual contrast and calls for moderation. The triad is yet another scheme that uses three colors, but this time they are evenly spaced around a color wheel, like purple, orange and green. Triadic color palettes tend to be quite vibrant, even if pale or unsaturated versions of the hues are used, but they are less jarring than the complementary schemes. The triad offers high contrast, but it retains good balance and harmony. To use a triadic scheme successfully, let one color dominate and accent with the other two. If you want a really vibrant room, use fully saturated versions of all three colors, but if this is too much for your eye, dilute the colors and incorporate neutrals. The tetrad is the richest of all schemes and offers the greatest variety, but at the same time it is the most difficult scheme to pull off effectively. It uses four colors spread equally around the wheel, which means we end up with two complementary pairs (the scheme is also called ‘double complementary’). The tetrad works best if you let one color dominate – otherwise the scheme may look busy and unbalanced. In other words, you should avoid using solid colors in equal amounts, and if you really want to spread them equally, make sure you balance the design with a neutral background. To make the palette less gaudy, it is advisable to dilute at least of the four colors. Now you know the basic color theory, but you may still have trouble picking the perfect scheme for your next decorating project. Besides, compliance with the color wheel theory is not the one and only determinant of success. Here’s what can inspire you and get you started. Don’t go for certain colors just because they look good together. The most important guideline should be your personal taste, so make your favorite color the base of the scheme and then work with the wheel (and other sources of inspirations) to complete the palette. If you love yellow, let it dominate in the design, and pair it either with a harmonizing or contrasting color, depending on how vibrant you want the room to be. If you love really bold colors, make the background neutral, and use your favorite hue in furniture. A good rug ties in the elements of your décor and makes a foundation for a room, so why not use it as a springboard for the rest of the room décor. If there is a fabulous rug that you love, let it be the starting point and lead the way to your room’s character. The colors and patterns on an eye-catching rug can inspire the selection of wall color, upholstery, throw pillows, curtains and other accessories. Remember about good color distribution. Let one color dominate, and make others either support or accent it. Richly patterned wallpaper can be a great foundation for your color scheme as it already contains a well-balanced combination of colors. In the design below, the yellow-green and pink floral pattern against a black background on the wallpaper inspired the use of the same colors, but in reversed proportions . To avoid monotony, different variations of the dominant color (purple) were used. What can be a better model for a well-coordinated color palette than a piece of art? Draw colors for your decorating project from a fabulous painting or poster, and you shouldn’t have much difficulty pulling off an appealing scheme. When choosing color from your artwork, make sure the walls are light enough for the art to pop. If you want to base your décor on the color you love but it is too bold for walls, incorporate it in furniture. An eye-catching sofa will make a great focal point to center the room around. To complete the scheme, choose colors that coordinate with the dominant furniture piece and keep most of your décor subdued. You may accessorize with pops of color, but make sure your principal color stands out nicely. Most decorating themes – nautical, eco, Scandinavian, etc. – are associated with a set of characteristic colors, so you can hardly go wrong with that. Just browse the web for some examples and recreate the palette in your design, using the rule of uneven color distribution. Think how you want to feel when you enter the room and pick colors that will help you create this ambiance. If you’re designing a space for creative, artistic work, consider bold, vibrant hues, but if go for white, beige or pale blue if you care for a relaxing atmosphere of a beach house. Planning a bedroom? Pale pink, lavender and light blues will make it sweet and romantic, but crimson or purple will set the stage for a passionate romance. Just make a list of feelings you want your room to inspire and choose colors that you associate with these emotions. Browse the web for ready-made color palettes and recreate one you truly love in your room. Design Seeds is a good place to start. Photo sharing services such as Pinterest, VisualHunt or Foter.com are limitless sources of inspiration for decorating projects. Trying to recreate the look from A to Z might be a little frustrating as you won’t always be able to find close equivalents of furniture and accessories in the pictures, but it’s definitely worth a try if you really don’t want to trust your own choices and judgment. By creating an inspiration board and collecting images that appeal to your taste, you’ll soon start to notice certain tendencies in things you like, so coming up with your very own design will be easier. Even if you have a definite plan and there’s no doubt you want to use a certain color scheme, there’s one more step you might want to take before you grab a paintbrush or go shopping for furniture – visualize. Interior designers often use mood boards to make sure the colors and their distribution will really work. Before you decorate, collect samples of fabrics, wallpaper and paint colors, cut out pictures of furniture and accessories from magazines, and lay it all out on a plain board. If there’s something that doesn’t coordinate well, remove it or replace it until everything looks coherent. You can also create mood boards online, for example here. Some websites offer you the opportunity to see how the colors of your choice will work together in sample rooms. These are not very sophisticated tools, but give you quite a good idea of what looks good and what does not. You may try Dulux MousePainter or a virtual designing tool such as Roomstyler.